This is such a pretty product that it took me a few days to actually take a brush to it and use it – I didn’t want to spoil the prettiness, how silly is that? But when I did I realised that it’s a gorgeous product, with the perfect mix of pink and bronze to really help lift the face. I’m currently using mostly the pink, but as Summer gets closer and closer I’d be inclined to use the bronze areas more too. I love that you can pick and choose between these, or swirl over the two for a healthy flush of colour. 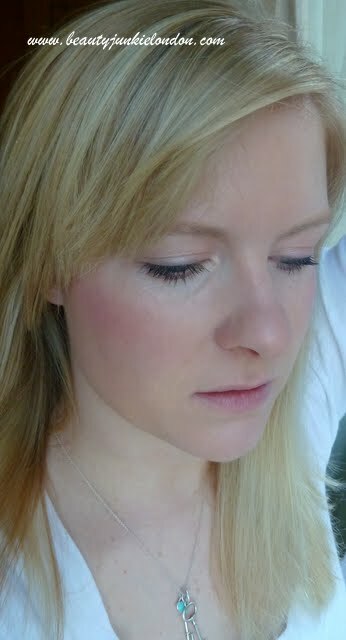 Estee Lauder Sea Star Bronzing Blush applied, in natural light. The top of the starfish does have an overspray of shimmer/glitter – but this fades after a few uses into a more subtle sheen rather than shimmer. If you like the look of this, move fast as it’s another Limited Edition one that’s part of the Estee Lauder Bronze Goddess range for Summer 2011 – the Sea Star Bronzing Blush costs £29. I really like the look of this and glad its not full of shimmer. Im really fair skinned, its not too orange is it? This is so pretty on and in the packaging, I know what you mean about not wanting to “spoil” it though – I really wanted the MAC seahorse one from last year but I would have been too scared to use it. It looks lovely on you Jen! I have a slight blush/bronzer obsession (which is ironically what my newest post is on), and this is absolutely gorgeous. The color works perfectly for you! I might have to give this a try! This looks gorgeous – going to have to indulge self! It’s so good to see what this looks like on someone with fair skin.